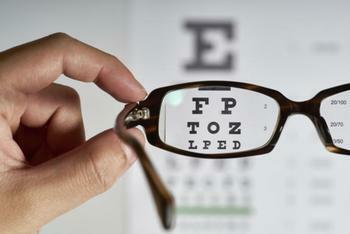 Inventors say they could replace current bifocal and progressive lenses. Camera optics are super-sophisticated these days, with auto focus that can bring objects at different distances into view with sharp clarity. So why can't eyeglasses do the same thing? It turns out they can. Scientists at the University of Utah have created what they call "smart glasses." They have liquid-based lenses that can automatically adjust the focus on what a person is seeing. Current eyeglasses attempt to do that using bifocal or progressive lenses. Your eyes are supposed to do that for you. Each eye has a lens that adjusts to what you are looking at, just like a sophisticated camera. But sometimes there are problems with these lenses, and as we age they loose the ability to change focus. Mastrangelo and graduate student Nazmul Hasan created eyeglass lenses constructed of glycerin, a thick colorless liquid enclosed by flexible rubber-like membranes in the front and back. Three mechanical actuators move the membrane, slightly changing the shape of the liquid lens, which also adjusts the focal length between the lens and the eye. “The focal length of the glasses depends on the shape of the lens, so to change the optical power we actually have to change the membrane shape,” Mastrangelo said. The two scientists also invented special frames to hold the lenses, along with a battery-powered electronics package to control the actuators. The bridge, which fits over the nose, has a distance meter using pulses of infrared light to measure the distance to an object. The meter instantly measures the distance to an object, telling the actuators how to curve the lenses. The lenses are capable of shifting focus from one object to another in 14 milliseconds. The glasses won't win any points for style. They look like the sort of glasses a nerdy cartoon character might wear. The glasses, though, work for anyone who needs vision correction. All you do is input your glasses prescription using a smartphone app, and the lens calibrate to the individual user. The inventors say the bulky design is just for testing purposes. They are currently working to house the package in lighter, more stylish frames that could be available commercially by 2020.